I used to own a couple of hamsters and rabbits as a child. I've always wanted a dog, but my parents disapproved of it until a few years ago. We adopted a dog from a shelter and she's now part of the family! Having a busy day at work and have a tight deadline? Can't find the time to bring your fur kid for a walk? Perhaps you're not feeling too well or have an emergency to attend to? Let me bring your fur kid for a walk instead! I volunteer at PAWS over the weekend and bring the dogs for a walk too! 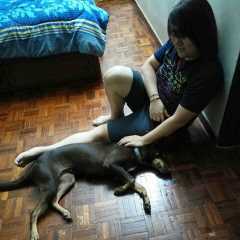 Melissa's Dog Walking service is located in or nearby Petaling Jaya, Selangor. Book via PetBacker for Insurance, Payment protection & 24x7 support. If you have hired Melissa before, leave a review now. Contact Melissa now with your pets info. If Melissa is busy, we can help include similar Backers.